Mr. Klote explains that virtually all schools require more assistance with fundraising today more than ever. “Schools of all types, including independent, charter, elementary, and high schools are facing difficult funding challenges with annual, capital and planned giving efforts. It is because of these challenges that our firm is providing the necessary information to assist these institutions to be more competitive. For this reason, we are offering complimentary copies this new book”, explains Klote. The book is a complimentary download at www.wdrincorp.com/complimentary-book-form. 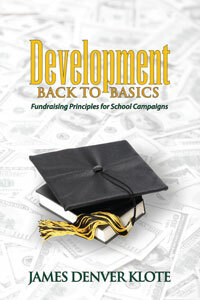 Development: Back to Basics Fundraising Principles for School Campaigns provides an inside look at the complexities of academic Capital Campaigns provided by the expert in full-time, resident-directed school fundraising consulting. Learn why the WD&R method of conducting a Capital Campaign will result in both higher contributions and increased school spirit. Learn why most school campaigns are hampered in their ability to raise significant funds and why yours doesn’t have to be. This book provides a roadmap on how to achieve success with a trained consultant at your side. If your school is considering a Capital Campaign, this is required reading. Jim is an invited speaker across the country at regional and national conferences and conventions, and serves on a number of national boards. In addition to local school and non-profit campaign efforts including churches and church related institutions, Jim has worked in various regional and national fundraising efforts. Jim lives in Great Falls, Virginia with his wife Molly, a physician, and their three children: Philip, Andrew, and Meredith.